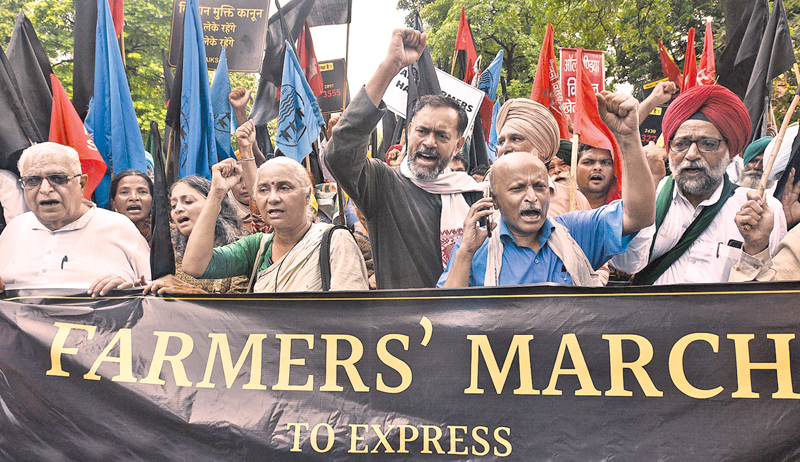 A farmers’ protest march in New Delhi, India, July 20, 2018. Last Thursday’s morning papers in India settled something that we have been debating for a while. A front-page report about the arrests of five political activists in The Indian Express read, “Those held part of anti-fascist plot to overthrow government, Pune Police tell court.” We should know by now that we are up against a regime that its own police calls fascist. In the India of today, to belong to a minority is a crime. To be murdered is a crime. To be lynched is a crime. To be poor is a crime. To defend the poor is to plot to overthrow the government. When the Maharashtra state police conducted simultaneous raids on the homes of several well-known activists, poets, lawyers, and priests across the country and arrested five people—three high-profile civil rights defenders and two lawyers—on ludicrous charges, with little or no paperwork, the government would have known that it was stirring up outrage. It would have already taken all our reactions into account, including all the protests that have taken place across the country, before it made this move. So why has this happened? Recent analyses of actual voter data, as well the Lokniti-CSDS-ABP Mood of the Nation survey, have shown that the ruling Bharatiya Janata Party (BJP) and Prime Minister Narendra Modi are losing popularity at an alarming (for them) pace. This means that we are entering dangerous times. There will be ruthless and continuous attempts to divert attention away from the reasons for this loss of popularity, and to fracture the growing solidarity of the opposition. It will be a constant circus from now until the elections in 2019—arrests, assassinations, lynchings, bomb attacks, false flag attacks, riots, pogroms. We have learned to connect the season of elections with the onset of all kinds of violence. Divide and rule, yes. But add to that—divert and rule. From now until the elections, we will not know when, and where, and how the fireball will fall on us, and what the nature of that fireball will be. * It has been a year and almost ten months since November 8, 2016, when Prime Minister Modi appeared on TV and announced his policy of demonetization of 80 percent of the currency in circulation. His own Cabinet seemed to have been taken by surprise. Now the Reserve Bank of India has announced that more than 99 percent of the currency was returned to the banking system. The Guardian reported last week that the policy has likely wiped 1 percent from the country’s GDP and cost approximately 1.5 million jobs. Meanwhile, just the printing of new currency has cost the country several thousand crores (a crore being 10 million rupees, equivalent to about $140,000). After demonetization came the Goods and Services Tax—a tax that is structured in ways that have dealt a further body blow to small and medium businesses that were already reeling under demonetization. * We all remember the farce in Mumbai at the “Make in India” event inaugurated by Modi in 2016, at which a huge fire burned down the main stage at the cultural festival. Well, the real bonfire of “Make in India” turned out to be the Rafale fighter plane deal with the French government, which was announced by the prime minister in Paris in April 2015 seemingly without the knowledge of his own defense minister. This is against all known protocol. We know the bare bones: a deal had already been put in place in 2012 under the Congress-led UPA government to buy planes that would be assembled by the public sector company, Hindustan Aeronautics Limited. That deal was scrapped by Modi and reconfigured. Hindustan Aeronautics was surgically excised. The Congress Party, as well as several others who have studied the new deal, have alleged corruption on an unimaginable scale and have accused the government of negotiating an “offset contract” for Reliance Defence Limited, a private sector company in India that is deep in debt and has never built a plane in its life. * The investigation by the Karnataka state police into the assassination of the journalist and activist Gauri Lankesh has led to several arrests, which have, in turn, led to the unveiling of the activities of several right-wing Hindutva organisations such as the extremist Sanatan Sanstha group. What has emerged is the existence of a shadowy, full-blown terrorist network, with hit lists, hideouts and safe houses, flush with arms, ammunition, and plans to bomb, kill, and poison people. * The speed at which educational institutions are being dismantled. The destruction of universities with fine track-records, the elevation of phantom universities that exist only on paper. This is arguably the saddest thing of all. It is happening in several ways. We are watching Jawaharlal Nehru University (JNU) being taken down before our very eyes. The students as well as the staff are under continuous attack. Several television channels have actively participated in spreading lies and fake videos that have endangered the lives of students, and these have led to an assassination attempt on the young scholar Umar Khalid, who has been mercilessly defamed. * Some other things we must not look away from: enormous distress in the agricultural sector, increasing numbers of farmers’ suicides, the lynching of Muslims and the relentless attack on Dalits, the public floggings, the arrest of Chandrashekhar Azad, the leader of the Bhim Army (a Bahujan-rights organisation), who dared to stand up to attacks by upper castes. The dilution of the legal protections for minority groups enacted in the 1989 Scheduled Caste and Scheduled Tribe (Prevention of Atrocities) Act. This second rally was attacked by Hindutva fanatics, which led to days of unrest. The two main people accused of fomenting this violence are Milind Ekbote and a Hindutva ideologue, Sambhaji Bhide. Both are still at large. Instead, following an FIR (First Information Report) registered by one of their supporters, in June 2018, the Pune Police arrested five people: Rona Wilson, a political activist from Delhi; Sudhir Dhawale, a Dalit activist from Mumbai; Shoma Sen, a professor from Nagpur; Mahesh Raut, an activist and former Prime Minister’s Rural Development programme fellow; and the lawyer Surendra at the January 1 rally, and also of plotting to kill Prime Minister Modi. They remain in custody, charged under the draconian Unlawful Activities (Prevention) Act. Fortunately, they are still alive, unlike the nineteen-year-old woman Ishrat Jahan, and Sohrabuddin Sheikh and his wife Kauser Bi, who were accused of the same crime, but did not live to see a trial because they were shot dead in what the police called “encounters,” claiming self-defense in what are suspected cases of extra-judicial executions (Ishrat Jahan in 2004; the other two in 2006). The Maharashtra state police say that this recent round of arrests is based on information gleaned from the documents seized from those arrested in June that implicates all the accused in a plot to fund and foment violence at the Elgar Parishad and the Bhima–Koregaon anniversary rallies, as well as in a plot to kill Narendra Modi. Justice Sawant and Justice Kolse-Patil have made public statements that they were the main organisers and sole funders of the Elgar Parishad, with the aim of rallying people against divisive Hindutva forces. Both have taken full responsibility for the event. Yet the police and the government have ignored them completely. The police and government have their reasons.